The PFCC statutory duties include agreeing the budget for Essex Police and Essex County Fire and Rescue Service (ECFRS) and for overseeing how these budgets are spent. The PFCC also sets the amount of money you will pay for policing and the fire service as part of your annual council tax bill. These charges are known as the ‘policing precept’ and the ‘fire precept’. Click on the link below for more information about the precepts for both services. The Commissioner actively monitors and scrutinises the performance of both services. Detailed records of the performance of Essex Police and Essex County Fire and Rescue Service are discussed at the relevant Performance and Resources Boards. The records discussed and minutes from the boards are published regularly and can be accessed by clicking below. The minutes of the meetings will always refer to the Performance summaries of the previous month. So, as an example, the meeting of February 2017 scrutinised Essex Police performance for January 2017. HM Inspectorate of Constabulary and Fire & Rescue Services (HMICFRS) independently assesses police forces and fire and rescue services across a range of activity. Copies of all inspections of Essex Police and Essex County Fire and Rescue Service, as well as the responses from the PFCC, are available by clicking here. Essex Police Professional Standards Department – The PFCC publishes quarterly reports on Essex Police conduct matters. These reports are available here. Please be aware that the performance summary documents are large in size and may take a few seconds to load. Roger Hirst is committed to involving the people of Essex in the decisions made on their behalf. He wants to understand your needs and views on the services he provides, particularly when working in partnership with Essex Police, Essex County Fire and Rescue Service and other organisations. Engagement Charter Mission Statement: To create a flexible programme of engagement, providing all communities with the opportunity to participate fully in the debate and decision making around policing and fire and rescue policy and practice in the county. Our engagement will be open and transparent, ensuring that the police, and the Office of the PFCC give you all the information we can, and as often as possible. We will make it as easy as possible to engage with us by holding our events at accessible places and times, and in the heart of communities across Essex. Wherever possible we will bring you together with the people most responsible for safety and policing and fire and rescue in your area, so you can get real answers from real people. We will use all the methods available to us to deliver information to you and consult with you including online and social media where appropriate. Our engagement events and activity will include and reflect the diverse communities of Essex. The public voice is evident in the Policing and Crime plan, and all decision making in the OPFCC. Public awareness of and confidence in the PFCC is increased amongst all communities. Services and support for victims in Essex are improved through direct engagement with vulnerable and at-risk communities. Engagement with larger online and social media audiences is achieved through better engagement with community organisations and groups. Partnership work is improved through increased joint working and a public led over-sight role. For more information about when the PFCC’s public meetings click here. The Police and Social Responsibility Act (2011) sets out a role for the PFCC that stretches beyond policing responsibilities to include community safety and criminal justice partners. The community safety partnership landscape is vast. In addition to policing, it also includes fire and rescue services, Criminal Justice agencies, Community Safety Partnerships (CSPs), Local Authorities, Victim Services, Health and Primary Care Trusts (PCTs), housing associations and education services. 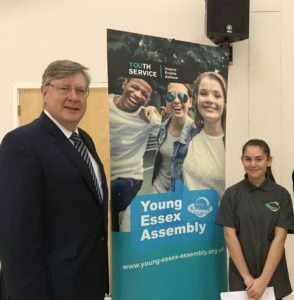 There is also a range of organisations across both the business and voluntary sectors that the PFCC works closely with in order to deliver an improved service to the people of Essex. The Act provides the PFCC with powers to award grants to any organisation or body he considers will support the community safety priorities set out in the Police and Crime Plan. Applications for grants from the 2019/20 Community Safety Development Fund will open on 1 April 2019. The PFCC strives to provide strong local leadership, underpinned by his democratic mandate, to cut crime and keep communities safe across a range of agencies and partnerships. Effective engagement with partners is key to ensuring their involvement in both shaping priorities and delivering high quality services to the people of Essex. Roger Hirst works with other local leaders to improve outcomes for communities and individuals and to ensure that local resources are used effectively and efficiently. This includes channelling collective local efforts to join up the criminal justice system and streamline partnership arrangements. Supporting victims of crime is one of the key areas of focus in the Police and Crime Plan for Essex . Mr Hirst is also a member of the Essex Domestic Abuse Strategic Board and works closely with Essex Police and partner agencies across Essex to help break the cycle of domestic abuse. Restorative Justice brings those harmed by a crime or conflict (a direct victim, or anyone who has been affected such as a victim’s family member or a witness) into contact with the person responsible for the crime or conflict to try to find a way forward. This is voluntary and both sides need to agree for the contact to take place. Restorative Justice can be effective in showing the responsible person the real impact of their actions by putting a face to their crime. It also gives the victim and/or family the chance to tell the offender how they feel about what has happened, ask for an apology and get answers to their questions. The victim may also have the chance to help decide what activity the offender can do to repair some of the damage done. It can help those who have committed crimes or anti-social behaviour reintegrate into society and helps to reduce reoffending. Find out more.